In the last few months I mentioned that Oracle is developing an Agent. 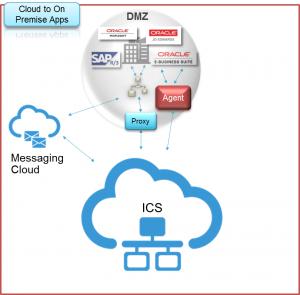 The Agent easily integrates your on-premises application(s) with the Oracle Cloud Services. The Agent is rolling out on all production instances next week. It was publicly announced by Bruce Tierney on the 3rd of January. He is the Director of Product Marketing for Cloud Integration and SOA. 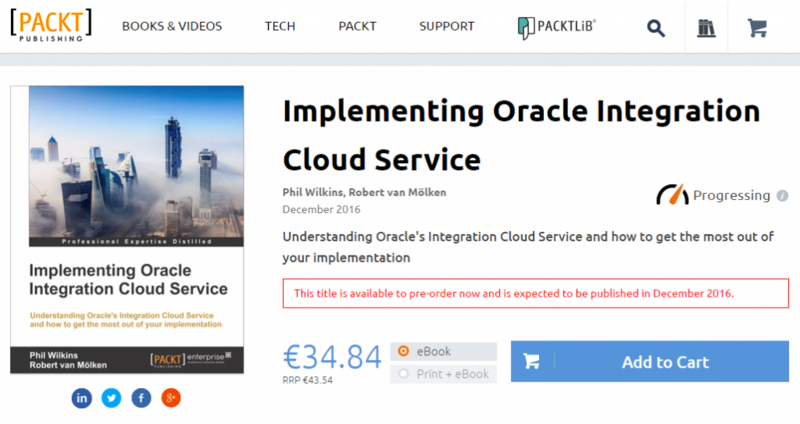 You can read his announcement on the Oracle Integration blog. In this first article about the Agent I will go into the architectural basics, which components are included and how it will connect Cloud to On-premises applications. The article is based on information I presented about during OpenWorld 2015. The current approach for connecting Cloud / Internet hosted applications with On-premises applications is usually through one or more firewalls, and the use of a reverse proxy, Oracle API Gateway or OHS. For this a variety of expertise is needed for example to open up inbound ports in the firewall, expose a private SOAP/REST service and configure the network routing. The SOAP/REST service can for example be implemented with SOA Suite to for example communicate with the CRM to retrieve customer data. This is going to change a lot when using the Agent. It will simplify above diagram. Currently there are three common patterns for Cloud to On-Premises integrations. They are 1. using messaging, 2. through a proxy and 3. using an agent. 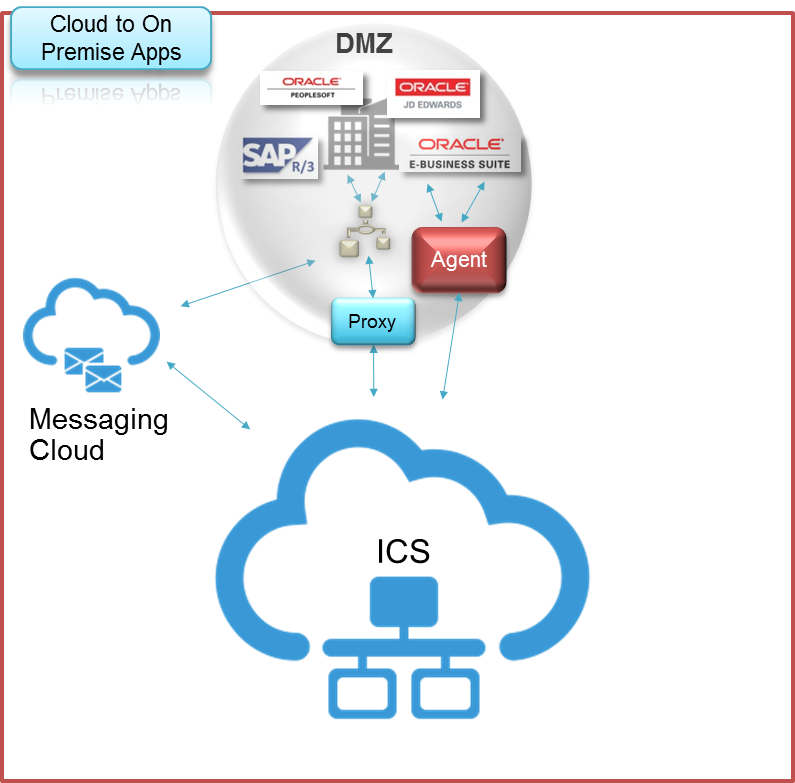 On-Premises SOA Suite is accessible with a web-Proxy in the DMZ, e.g. API Gateway or OHS. On-Premises SOA Suite hosts the adapter that Cloud application can invoke. Integration Cloud Service sends the messages through the Proxy. On-Premises SOA Suite polls the Messaging Service. On-Premises SOA Suite hosts the adapter where messages can be published to. The agent is started on the customer’s internal network. The agent establishes a communications tunnel with ICS. Integration Cloud send messages through the tunnel to the Agent. The agent hosts the adapter to communicate to the On-Premises application. if we use agent on communication between cloud and on-premises , no need to open up inbound ports in the firewall in customer side is that right? it’s a dedicated tunnel for oracle cloud? Hi Robert: can this agent also be used with the SOA CS? Or ICS only? At this point it is only for ICS. But it is mentioned by Oracle that it would also come to SOA CS at some time.